Track & field is broken up into the winter (indoor) and spring (outdoor) Many athletes from other sports join either season to stay in shape during their off-season. At some point, Sea has over 120 athletes compete for 1 season (XC, Indoor or Outdoor) Most of the indoor meets take place at Ocean Breeze on Father Capodanno Blvd in Staten Island. The outdoor meets take place at many different venues throughout the 5 boroughs During the outdoor season, our team hosts a few meets with special emphasis placed on our home meet, the Big Blue Track & Field Classic. 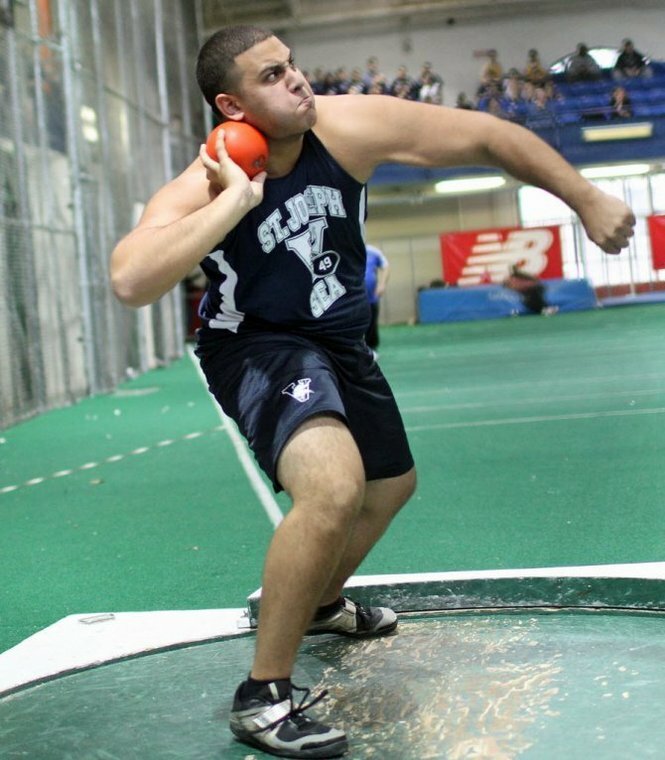 Track & Field offers a wide array of events for athletes of various abilities. Runners can race in events from the 55 meter dash (approx 60 yds) to the two mile run. Track & field uses the metric system to measure races. Some quick conversions include: 100 meters = 110 yards, 400 meters = 440 yds. There are also relay races where 4 runners run a specific distance and hand off a baton (stick) at the end of their run (leg) to the next athlete. The 4x400 or 1600 meter relay is an event where each member of the team runs 400 meters for a total of 1600 meters. Athletes with explosive speed usually flock to the shorter events. Athletes with a good base and stamina enjoy the mid to long distances. In addition to the running events, the field events give athletes plenty of opportunities to try new things. During these seasons, the field events contested are the: pole vault, long jump, triple jump, high jump, shot put, discus and javelin. Each event requires unique skills and lots of practice to perfect. Most of these events require explosive speed and strength. A specialty event, although not a field event are the hurdles. There are different distances that are raced according to each season.